If you’re living with arthritis and suffer from stiff and painful joints, sometimes the last thing you want to do is get up and exercise. But low impact exercise such as yoga can help to not only mobilise the joints but also strengthen them, without exacerbating any pain. If you’re interested in learning more about how yoga might help, why not try our top five yoga poses for joint mobility and stability? There’s a pose for all kinds of flexibility and mobility levels. The seated side stretch works to elongate the spine and lubricate the hip and knee joints. It also releases some of the muscles that can make our shoulders feel tight. If sitting on the floor doesn’t feel right for you, sit on a pillow for added comfort, or opt for a chair instead. Start with 3 gentle shoulder rolls, send them towards the back first, then rotate them the other way. As you inhale, raise your right arm up towards the sky coming from the side of your body, place your left palm down to the floor and lean into it. Your right arm will move over your head. Hold this pose for at least five long breaths before repeating on the other side. You may even like to try moving using one breath per side and repeating at least 5 times. Cat and cow are two poses that work together to mobilise the spine. Combined with the breath, the gentle arch and rounding action helps to lubricate the spinal joints, from the neck, all the way to the lower back. Sitting on your knees, walk your hands out in front of you so they’re directly under your shoulders and your hips are over your knees, like a tabletop. If this is causing you some pain in your wrists or knees, you can always pad them out with a rolled up blanket under the heel of the palm or under the knees. Otherwise you can sit in a chair. First take an inhale in a neutral spine. As you exhale, begin to round up through your back like an angry cat, tucking your chin in. You should feel a nice stretch along the spine. On your inhale you’ll slowly arch the back down so that your chest is reaching out in front of your body, and the chin will lift slightly. Repeat this action at least 5 to 10 times. Tree pose not only offers your knees and hips a way to build strength and stability, but it also promotes balance and focus. To start, stand with your feet hip-width apart, then gently create some circular motions with your hips to warm up the hip joint. Find a spot to gaze at, either on the floor in front of you or straight ahead. Move your weight into your left leg. You’ll then place your right toes on the floor, with the heel resting on the ankle, or lift the foot to be flat on the calf, or for the full variation you can place it on your inner thigh. You can choose whichever variation works for your range of motion. Just be sure to avoid the knee. Bring your hands to your hips to help with your balance. You can also use your hands to check your hips are even and facing forward. You may need to lower one to make sure they are in line. Keep a long straight spine, and engage your core muscles lightly to help you with your balance. If you find yourself feeling wobbly and require some extra support, you may use a chair to rest your knee on, or you can even lean back into a wall. Hold this pose for at least 5 long breaths before repeating on the left side. Warrior 2 is a standing posture that works to strengthen the entire body. The spine and knee joints build endurance and strength from being aligned, while the hip joint and the shoulders are strengthened and mobilised. Start by standing with your feet together, or hip-width apart. Step your right foot towards the front of the room, with your toes facing outwards slightly, by externally rotating your leg. Bend into the leg so you create as close to a 90-degree angle as possible with your shin and thigh. Next, you’ll step your left leg towards the back of the room. This leg will be straight, and your toes will slightly turn in. Work to squeeze your thigh muscles together as this will help to support the knees and hips. Place your hands on your hips, slightly engage your core muscles and work to lengthen through the spine. If you find this posture difficult to balance in, use a chair for added support. Hold this pose for at least 5 long breaths before repeating on the left side. Supine twist is a beautiful posture which promotes restoration and relaxation. It also works to warm up and lubricate the spine thanks to its twisting motion. Lying flat on your back, hug your knees into your chest, then drop them over to your right side first while you keep your left shoulder touching the floor. If your knees and feet are struggling to touch the ground and your left shoulder is lifted, simply place a pillow under your knees for a little bit of extra height. Hold for 30 seconds and then repeat on the other side. 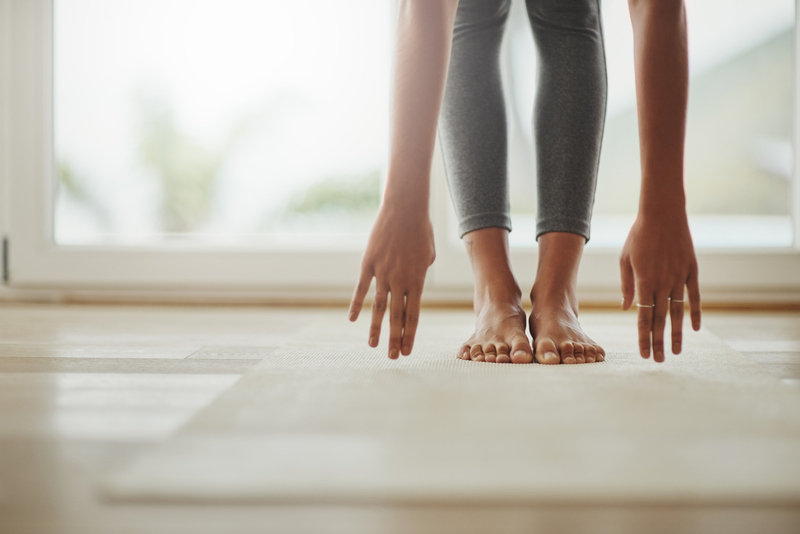 If you’re living with arthritis and yoga isn’t for you, there are plenty of other low impact exercises you can try including tai chi, swimming and walking.